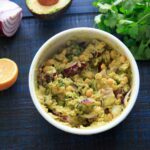 This Smashed Avocado and Chickpea Salad Sandwich is an easy vegan recipe to throw together for a healthy lunch or dinner with only 5 main ingredients (plus bread). 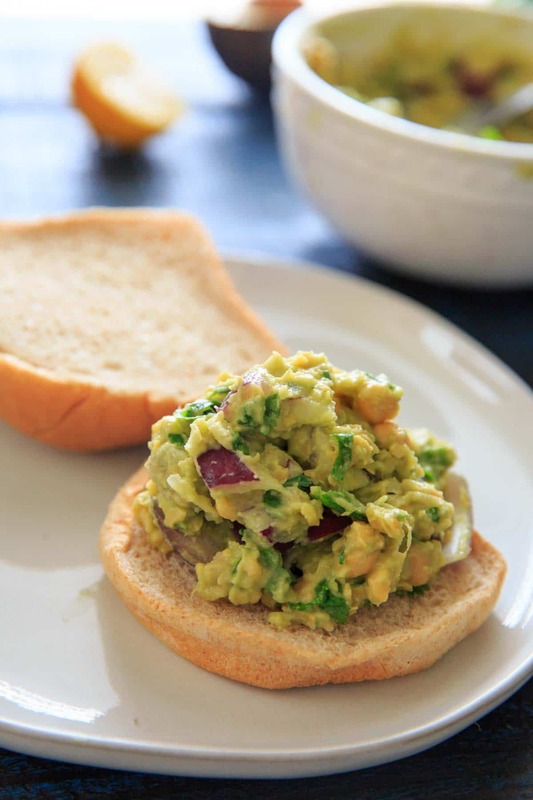 If you like chickpeas and avocado, you’re going to love this sandwich. I happen to love both, so this is going to be on constant rotation for meal planning now. 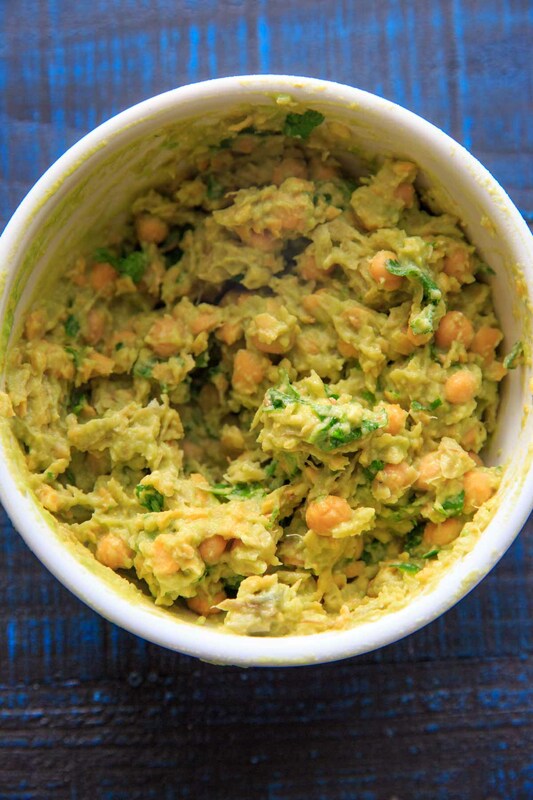 Get a can of chickpeas, an avocado, half a lemon and salt. Then you’re going to mash it all together! 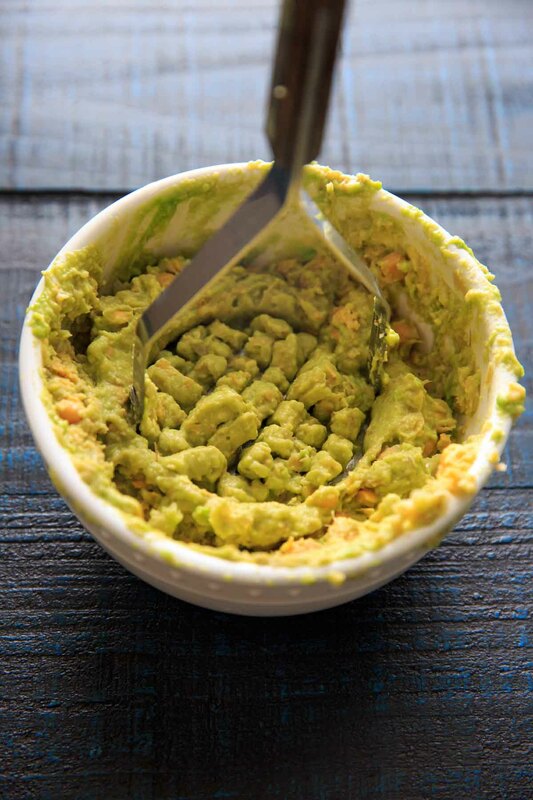 Sometimes the chickpeas are harder to mash down but the idea is more to make sure the avocado is mashed. Mix in cilantro (try with parsley if you hate cilantro). Personally I think the crunch factor is really important in a mashed salad like this, so I highly recommend adding red onion. You could also use celery for crunchiness if you’re not a fan of the onion, or even vegan bacon would be good with this! You can ditch the bread altogether if you want to eat it now, or choose to wrap in some lettuce. Or even use as a dip. 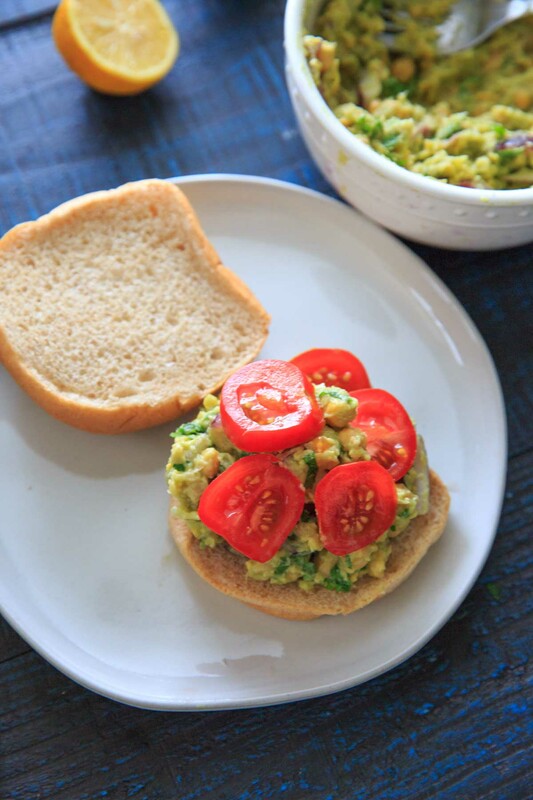 I’ve tried this with hamburger buns, kaiser rolls, or regular sandwich bread – I don’t discriminate! Optional (but delicious toppings) include tomato slices, baby spinach, or more red onion. 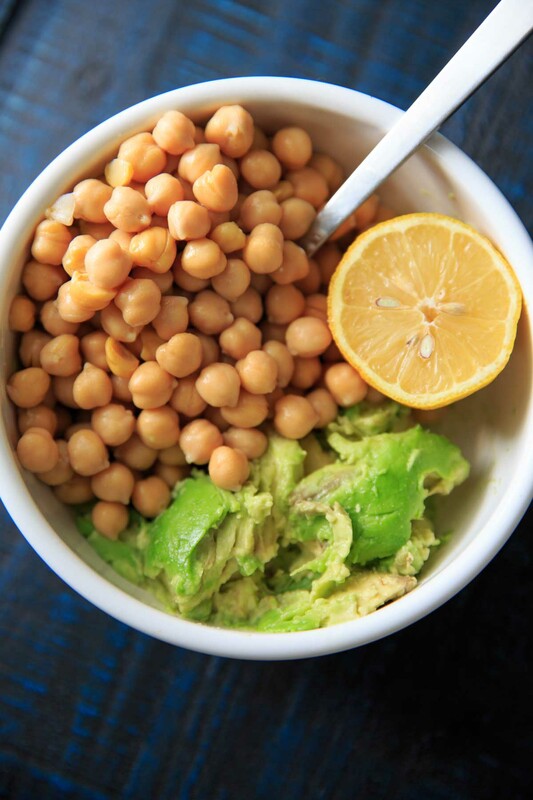 In a medium bowl, smash rinsed chickpeas and avocado with a potato masher or fork. 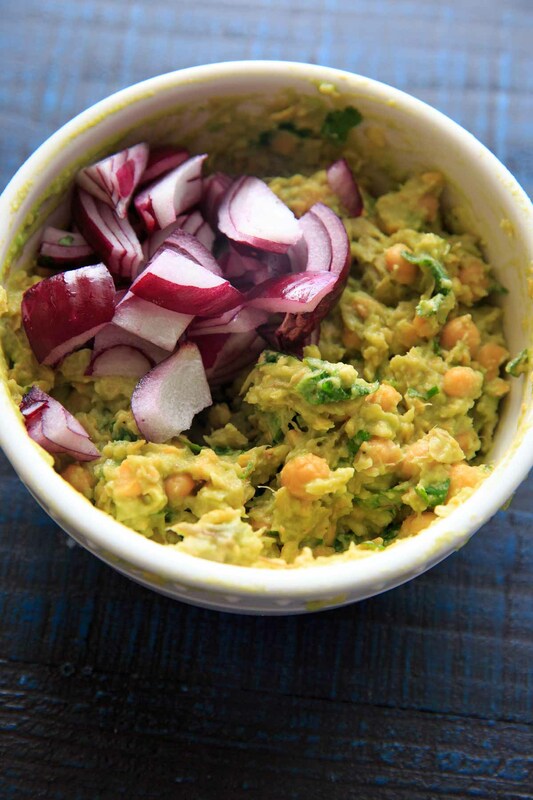 Mix in chopped cilantro and red onion. Add salt to taste and spread on sandwich bread and tomato slices as desired. Store any leftovers in fridge for 2-3 days! *Calories do not include your choice of bread. Will it not turn brown if left overs are stored in the fridge for later use? The lemon juice helps with this! I didn’t have Garbanzo so I tried Cannellini instead and it was delicious! I tried this recipe with brown bread for lunch today. 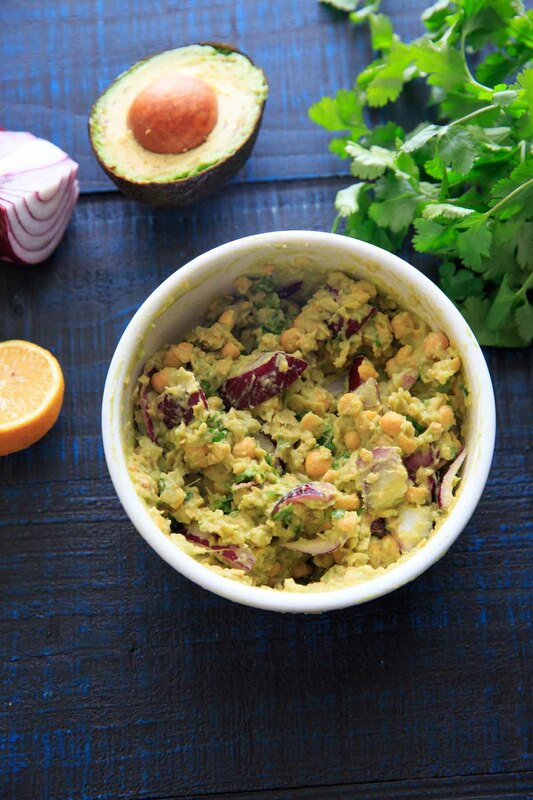 To your basic 5 ingredients I added a little finely sliced celery stem, chopped cilantro, chopped parsley, 1/4 tsp turmeric powder and 4 pieces sliced tomato. It was very nice, a change from plain avo and cheese sandwich. I am a vegetarian (not vegan) who has dairy products and eggs.